A team of astronomers, including Danai Antonopoulou and Anna Watts from the University of Amsterdam, has discovered that sudden speed jumps in the rotational velocity of pulsars have a minimum size, and that they are caused not by the unpinning and displacement of just one sub-surface superfluid vortex, but by billions. This result is important to our understanding of the behavior of matter under extreme conditions, and has been published this week in the journal Monthly Notices of the Royal Astronomical Society. 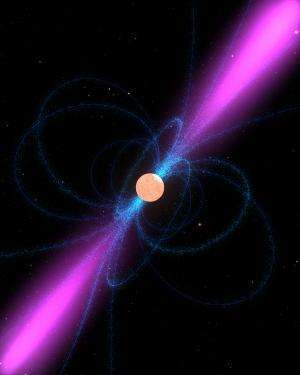 Pulsars are rotating neutron stars - remnants of massive stars that end their lives in supernova explosions. They act like cosmic lighthouses whose beams sweep through the Universe. Their rotational velocity decreases in time, but can suddenly increase in rare events called glitches. These glitches are caused by the unpinning and displacement of vortices that connect the crust with the mixture of particles containing superfluid neutrons beneath the crust. The team of astronomers discovered that the glitches of the Crab Pulsar always involve a decrease in the rotational period of at least 0.055 nanoseconds. The Crab Pulsar was one of the first pulsars to be discovered and has been observed almost daily with the 42-ft Telescope at the Jodrell Bank Observatory over the last 29 years. The huge amount of data makes this object the best choice to study glitches. The smallest glitch is likely to be caused by the unpinning and movement of billions of vortices. "Surprisingly, no one tried to determine a lower limit to glitch size before. Many assumed that the smallest glitch would be caused by a single vortex unpinning. The smallest glitch is clearly much larger than we expected", says Danai Antonopoulou from the University of Amsterdam (UvA). "Astronomers would of course like to know whether the smallest glitches of other pulsars are also caused by billions of vortices. The next step is to sift through the data of other pulsars and to continue observing", says first author Cristobal Espinoza (IA-PUC, Chile). Antonopoulou's supervisor Anna Watts (UvA) adds: "By comparing the observations with theoretical predictions we learn about the behavior of matter in these exotic objects. The precise cause of glitches is still a mystery to us, and this result offers a new challenge to theorists."